Document the current conditions of Arverne East in Far Rockaway, Queens, a site currently undeveloped but possibly undergoing change in the coming years. 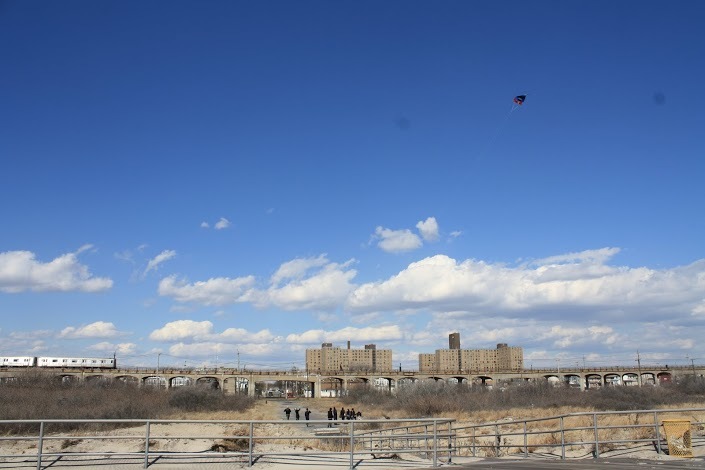 The site consists of 81 acres of undeveloped City-owned land, bounded by Edgemere Avenue to the north (also where the A-train runs above ground), Beach 32nd Street to the east, the boardwalk to the south, and Beach 56th Place to the west. 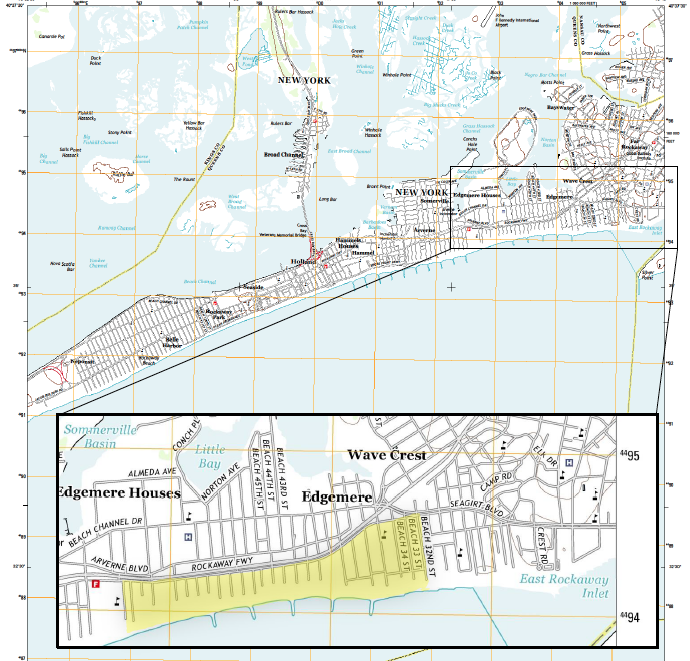 Arverne East is part of the larger Arverne Urban Renewal Area, and was completely submerged during Hurricane Sandy. 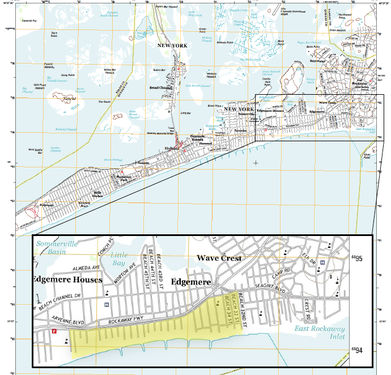 It’s located in FEMA Special Flood Hazard Area Zone A, and was selected as the site for the FAR ROC: For a Resilient Rockaway Design Competition held last year. The winning design solution is a mixed-use, mixed-income development, planned around strengthening the community and increasing resiliency to future storm surges. The design solutions that came out of the competition are significant and will act as prototypes and springboard for innovative strategies in planning resilient communities in low-lying, flood-prone areas. We scheduled a site visit in late January to map out a proposed flight path, and to confirm that the area was suitable for flying our kite. During the site visit we decided that the team should remain near the southern bounds of the site (boardwalk) to avoid power lines and heavy car traffic on the northern bounds of the site (Edgemere Ave). We captured audio clips inside the site as an additional record of on-the-ground conditions. We held a dry-run flight in Fort Greene Park in mid-February to test the camera housing and interval shooting. We didn’t get much wind that day (and the park was full of kids on sleds), but it was useful to get a sense of whose hands would be doing what and additional responsibilities for folks not flying the kite. One week before the flight we submitted Form 7711-2 for a certification of waiver or authorization to fly our kite through the FAA FSDO. This is necessary for sites located within five miles of an airport, in our case, JFK. We borrowed two kites (purple delta zenith, rainbow double delta conyne), two pre-hacked cameras (Canon Powershot A495) with interval shooting every 15 seconds, and a couple pairs of work gloves from the Public Lab lending library. Since we were flying on the beach in winder conditions, we only ended up using the double delta conyne. We used the hoop winder and line, rubber bands, and swivel for the rigging and housing from the Public Lab balloon mapping kit. 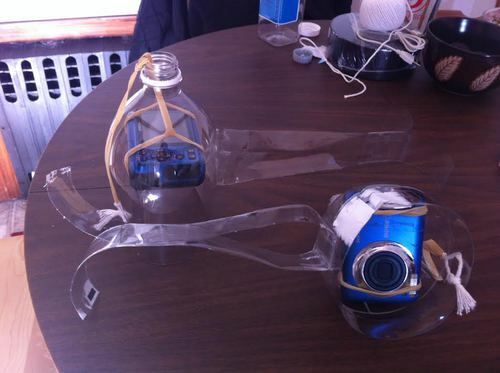 Thanks to the PET bottle & rubber band rig tutorials we built two housings for flight day. Saturday, March 15th turned out to have great conditions for flying. The temperature averaged in the low 50s with AM clouds/PM sun, with winds at 15-21 mph. There was no problem getting the kite into the air, but it took a lot of effort, and at least three people, to wrangle the kite back in to check the photos and battery life. We started at Beach 56th Place and headed east with the kite. We were at the site for approximately four hours (11:30-3:30) and collected photos on four different flights. We launched the kite from Beach 56th, Beach 46th, Beach 41st and Beach 39th. The conditions at the beach were windier than expected, and we had less control of the camera housing than we anticipated. During the first flight the camera shifted and positioned the lens towards the inside of the bottle housing. As a makeshift solution, we stuffed the nylon casing for the kite into the top of the housing. The camera stayed in place for our next flight, but the nylon casing fell out (imagine a black eel in the sky swimming slowly to the ground) during our third flight, so we had to wrangle the kite back in sooner than we would have liked. To secure our makeshift solution, we pushed the string of the nylon bag through the bottle neck and connected it to the swivel on the rigging. Additionally, we swapped out the AA batteries before the last flight. We collected 186 photos during the four flights, with about 50 of these being usable. The photos that were collected during our kite flight gave us a better understanding of the current vegetation cover, and where within the site vehicles travel as no thru streets exist. We actually saw one jeep joyriding around the dunes of the site during our mapping day. 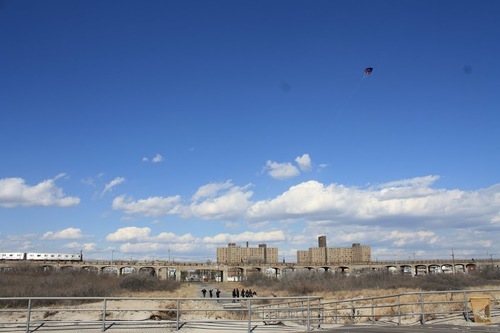 These photos also add to the historical record of the Arverne East site before re-development. 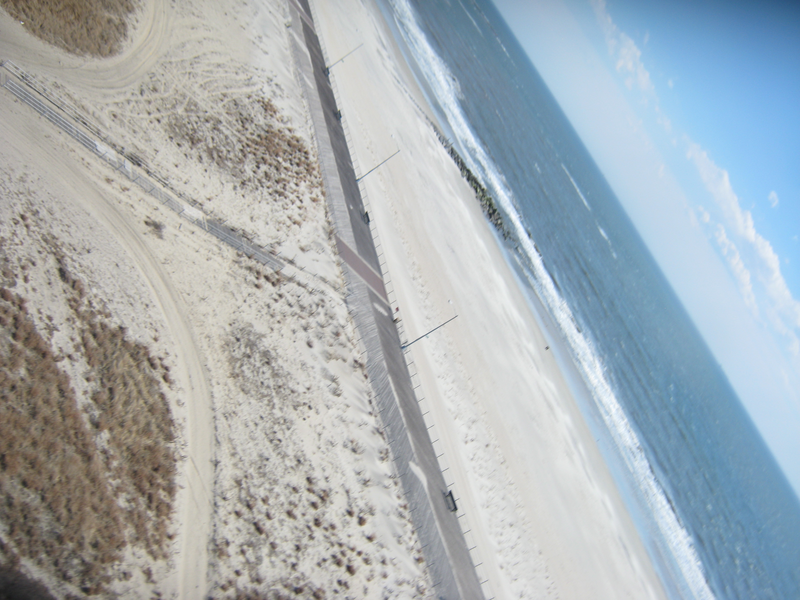 You can see the set of photos collected on our March kite flight here on flickr. It would be interesting to return to the site during other seasons, and capture photos of the vegetation cover in late spring, summer, and fall. Our sound engineer is also hoping to capture the piping plover season. Since the majority of the site looks similar block to block (undeveloped, with patchy vegetation), we discussed what could be done to help in georeference the photos during the stitching process—holding up different colored construction paper at each of the intersections, taking a photo on the ground of something/someone to denote different sets, keeping the kite closer to the ground, or simply just using the timestamp as reference. It’s clear that we won’t be able to stitch together a complete and coherent map of the site, but we’d still like to use Mapknitter to discover which patches of the site were collected and to better inform the group of how to map in homogenous areas and similar weather conditions. Research, event organization, and kite mapping done by Urban Solutions, a group of planners, engineers, designers, and analysts, who meet to talk about and tackle projects that explore different challenges and aspects of the city.